Sorry. Can’t see any resemblance. “The Catholic League for Religious and Civil Rights and the Anti-Defamation League were less than amused. Mr. Foxman would do well to consult the historical record. Vatican support for the Third Reich is a simple matter of fact. And there has of course been pushback. “In 1999, John Cornwell’s Hitler’s Pope criticized Pius for not doing enough, or speaking out enough, against the Holocaust. Cornwell argued that Pius’ entire career as the nuncio to Germany, cardinal secretary of state, and pope was characterized by a desire to increase and centralize the power of the Papacy, and that he subordinated opposition to the Nazis to that goal. He further argued that Pius was anti-Semitic and that this stance prevented him from caring about the European Jews. Cornwell’s work was the first to have access to testimonies from Pius’ beatification process as well as to many documents from Pacelli’s nunciature which had just been opened under the 75-year rule by the Vatican State Secretary archives. Cornwell’s work has received much praise and criticism. Much praise of Cornwell centered around his disputed claim that he was a practising Catholic who had attempted to absolve Pius with his work. 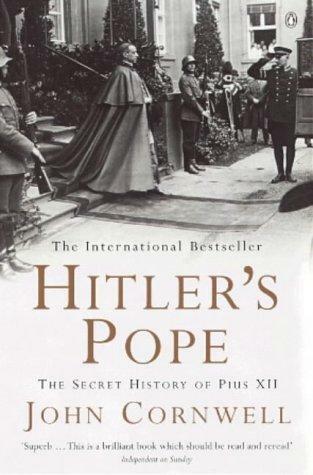 While works such as Susan Zuccotti’s Under His Very Windows: The Vatican and the Holocaust in Italy (2000) and Michael Phayer’s The Catholic Church and the Holocaust, 1930–1965 (2000) are critical of both Cornwell and Pius XII, Ronald J. Rychlak’s Hitler, the War and the Pope is critical as well but defends Pius XII in light of his access to most recent documents. Cornwell’s scholarship has been criticized. For example, Kenneth L. Woodward stated in his review in Newsweek that “errors of fact and ignorance of context appear on almost every page.” Five years after the publication of Hitler’s Pope, Cornwell stated: “I would now argue, in the light of the debates and evidence following Hitler’s Pope, that Pius XII had so little scope of action that it is impossible to judge the motives for his silence during the war, while Rome was under the heel of Mussolini and later occupied by Germany”. In the 1997 biography, “Salt of the Earth,” Ratzinger said he was registered against his will in the Hitler Youth by his seminary and had no connection to the group after ending his religious studies. He was later conscripted into the German army, at age 16, for what he called “relatively harmless” infantry duty from August 1943 to September 1944.